The Battle of Crysler’s Farm 11 November 1813. In September 1813 the USA invaded Lower Canada with the intention of capturing Montreal, thus cutting the lines of supply to British troops in Upper Canada. See this website for a map of the theatre of operations. Two US armies took part in the invasion. One, commanded by General Wade Hampton, was to move from Plattsburgh along the River Chateuaguay, whilst the other, under General James Wilkinson, was to advance from Sackett’s Harbor along the River St Lawrence. The two were to unite at Montreal, but co-operation between them was hampered by a long running feud between the two US generals. On 6 November Wilkinson learnt that Hampton’s army had been defeated by a Canadian force in the Battle of the Chateuaguay on 26 October. Wilkinson sent a messenger ordering Hampton to march west and rendezvous with him at Cornwall in Eastern Ontario. However, Hampton was retreating towards winter quarters at Plattsburgh. Wilkinson’s 8,000 men were being followed and harried by a 1,200 man corps of observation as it sailed down the St Lawrence. It was commanded by Lieutenant-Colonel Joseph Wanton Morrison, a British officer who had been born in New York when it was still under British control towards the end of the American War of Independence. 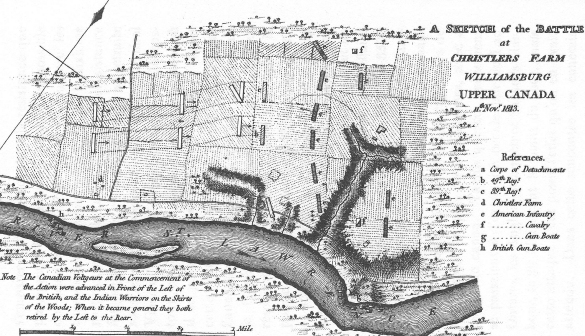 The main British force was at their naval base of Kingston, which they assumed was Lawrence’s objective. Morrison’s troops consisted of a mixture of British regulars from the 49th and his own 89th Regiments of Foot, three Royal artillery guns and crews, Canadian Fencibles, Canadian Voltigeurs, Tyendinaga and Mississauga Mohawk warriors and the Dundas County Militia. They were supported by a flotilla of gunboats commanded by William Howe Mulcaster. Two-thirds of the 270 Canadian regulars were French speakers. On 10 November a skirmish was fought at Hoople’s Creek. The next day Wilkinson decided that he needed to chase Morrison away before crossing the Long Sault Rapids. He was ill and his second in command, Major-General Morgan Lewis was unavailable, so Brigadier-General John Parker Boyd was put in command. On 11 November the Americans were slow to attack, used only 4,000 of their troops and committed them piecemeal. They lost 102 killed, 237 wounded and 120 captured. Anglo-Canadian casualties were 31 killed, 148 wounded and 13 missing. About a third of the Fencibles, half of whom were French-Canadians, became casualties. The American attack was called off after three hours. Their men were tired and hungry, and they had fewer experienced officers than their opponents. Despite the defeat Wilkinson ordered his army to cross the Long Sault rapids. However, the next day he received a message informing him that Hampton would not make their planned rendezvous, as he had retreated to winter quarters. Wilkinson therefore ordered his army to retire to winter quarters at French Mills. As well as ending the US 1813 invasion, the battle is very important in Canadian history because it was a victory won by a mixture of British, English-speaking Canadians, French-Canadians and Mohawks. The Friends of Crysler’s Farm Battlefield Memorial. The Register of Canadian Historic Places. Hampton’s army included 1,000 men of the New York militia, who refused to cross the border into Canada, leaving him with about 3,000 troops. On 25 October he encountered a Canadian force commanded by Colonel Charles-Michel d’Irumberry de Salaberry, a French-Canadian British Army officer who had formed the Voltigeurs, a unit of French-Canadian regular light infantry recruited for service in Canada only. De Salaberry’s 1,800 men were a mixture of Voltigeurs, Fencibles, who were recruited for service in North America, militia and First Nations warriors. All were Canadians. British armies had included Canadians in most of the previous battles of this war, but this was the first action to be fought entirely by Canadians. 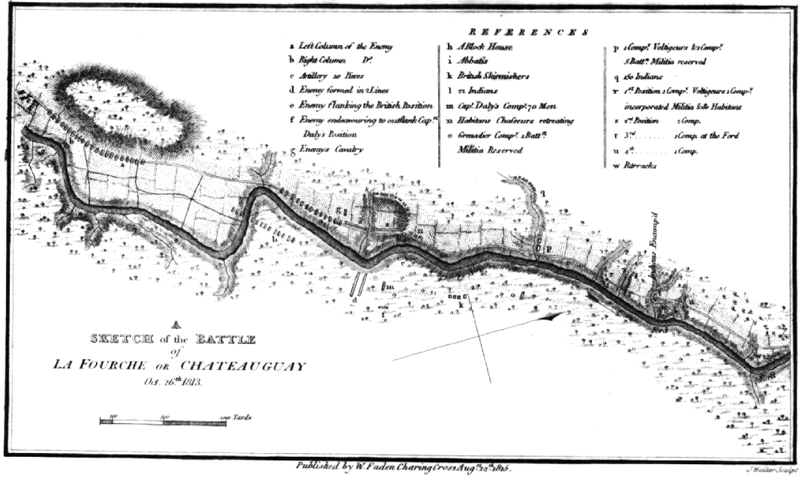 De Salaberry’s troops were well entrenched, so Hampton sent one of his two brigades, commanded by Colonel Robert Purdy, to cross the Chateuaguay by a ford and take the defenders in the flank. He would launch a frontal assault with the rest of his troops. Soon after Purdy’s force departed Hampton received a message from War Secretary John Armstrong informing him that winter quarters were being built for his men. Hampton assumed that this meant that the invasion was to be halted, but could not recall Purdy, so went ahead with his attack. Purdy’s guides were unreliable, and his force got lost. It found the ford around noon, but was beaten back by the Canadian defenders. The US troops came under accurate Canadian sniper fire, whilst their own muskets had unreliable ammunition. The frontal assault began at dawn on 26 October, but without support from the flanking attack it was unable to make any progress against the strong Canadian defences. De Salaberry sent buglers into the woods to sound the advance, making the Americans think that they were outnumbered and at risk of being outflanked. The firefight lasted for several hours until 3pm, when Hampton called off the attack. His army retreated to winter quarters in the USA. The US lost 23 dead, 33 wounded and 29 missing. Two Canadians were killed 16 wounded and four reported missing. This was a small battle, but it stopped half of the US attack on Montreal, and it was the first military victory of an entirely Canadian force.